The Whitebox A4 Feint Ruled Pad boasts a high number of pages, each of which has been formulated from high quality materials which will protect against bleeding through. Being able to take down notes at a moment's notice is certainly a skill which would benefit most people, regardless of their line of work. 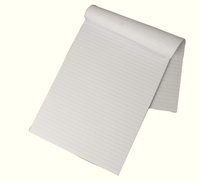 As such, companies like Whitebox have formulated some high quality products with your notes in mind. Buy Individual or in a Pack of 5, 10 or 20 pads with 160 pages per pad. Approx Dimensions (CM): D41 W20 H20. Approx Weight (KG):4.5.